Raymond Harper's Book: "A History of Chesapeake"
This weekend, the Jordan Bridge in Chesapeake, Va. will close permanently. It's the oldest drawbridge in Virginia and a shortcut for many residents to and from the shipyards. Employees there will have to find new ways to get to work after the bridge closes. Many small bridges around the country are closing permanently, giving Americans rough commutes and forcing them to spend more time and money to get to their jobs. We speak with Raymond Harper, a local historian from Chesapeake, about the closing of Jordan Bridge. Raymond Harper: I have known the bridge my entire life. Other than the times that I was away in the military for World War II and college and that kind of thing. So the bridge has been something I could cross if I needed to go to Portsmouth. I could be in Portsmouth in minutes. But it means a lot more to people working over there. John Moe: Describe what the bridge looks like? Harper: It's a vertical lift type of bridge. It has a section of roadway between two towers. 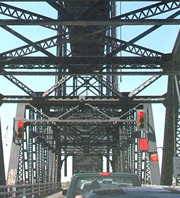 The middle section of the bridge, there's a house there where the operator is seated. It's a black bridge there on the water. There's a lot of steel and that sort. The bridge was built by two brothers, the Jordan brothers, at the south Norfolk approach where they had a lumberyard. Moe: I was just looking at this Jordan Bridge online. When we first brought this topic up, I was like 'Oh, it's probably some old cement bridge.' But it's really beautiful. Moe: What has it been through to get to the state where it is now? Harper: Of course it's had its ups and down from then and now. Starting back on June 2, 1939 about 8:30 in the morning, a Texas oil tanker by the name of Rhode Island struck the bridge and it knocked out that portion that lifts. It knocked it 122 feet into the Elizabeth River. And so now we fast forward to 2004 -- the bridge closed. The problem this time was that a tugboat operator misjudged the height of the mast on a barge that he was pulling. Moe: What are the reasons being given for closing it now? Harper: Deterioration. The bridge was turned over to the city of Chesapeake in 1977. It has not had the proper preventive maintenance during that time. It's been rusted out. There was an inspection earlier this year and they gave it a "three" which meant the load limit would be three tons of vehicles going across. Moe: What will this mean to people who either live and work on either side of the bridge in their day-to-day living? Harper: It means they will have to detour quite a lot - quite a few miles. And one of the detours will be across another bridge that's been declared unsafe. Of course that will increase the traffic across that bridge and also increase the traffic through the tunnel from Norfolk to Portsmouth. Moe: Can you even imagine your life without that bridge being there? Harper: It's definitely going to be different. It really is. I mean, it seems like every once in a while something that I've been used to my entire life is gone and the bridge is going to be one of them. I'd love to hear a follow-up series about how this economic crisis has more and more states and localities turning over public roads to private companies to make necessary improvements that the government can no longer afford, in exchange for the right to toll these crossings at a much higher rate for generations to come. That appears to be the only way the Jordan Bridge might ever be rebuilt, as well as two other nearby crossings of the Elizabeth River.